For today’s second challenge we’re headed down to the shore for a color challenge that we’re calling SAND & SEA – USE BLUES & TANS (any and all shades). Any theme or sentiment is fine so long as you use blues & tans. 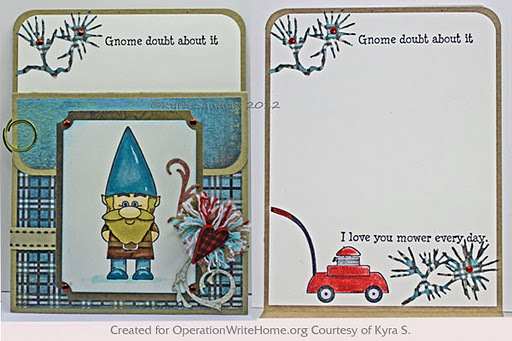 Our great sample card for this challenge was created by Kyra S. What a super fun card… Gnome doubt about it! Now let’s see what you create for this color challenge. Gnome doubt about it Kyra – your card is really cute and so cleverly designed! Love it! Love the gnome and your card. The inside of your card is really cute, love the pun!